Eps 101 - The Impending Warriors of Justice! The Pride Troopers!! Eps 102 - The Power of Love Explodes?! Universe 2's Little Witch Warriors!! Eps 103 - Gohan, Show No Mercy! Showdown With Universe 10!! Eps 104 - The Ultimate High Speed Battle Begins! Goku and Hit Join Forces!! Eps 105 - A Desperate Battle! Master Roshi's Sacrifice!! Eps 106 - Find Him! Death Match With An Invisible Attacker!! Eps 107 - Revenge "F" The Cunning Trap?! 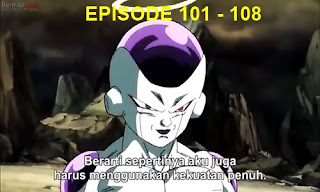 Eps 108 - Frieza and Frost! Conjoined Malice? !